Posted on 24/06/2010 by Trần Phước Hùng	| Bạn nghĩ gì về bài viết này? 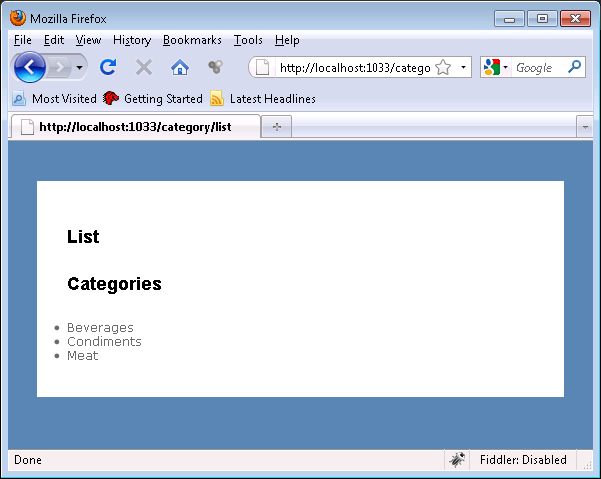 In ASP.NET WebForms, UserControls were used to break the application into smaller pieces. Each piece represented an important part of the application. In ASP.NET MVC application you can achieve the same effect using RenderPartial and RenderAction methods. In this article we are going to demonstrate how to use RenderPartial to construct and use partial views. RenderPartial serves the purpose of rendering a UserControl in an ASP.NET MVC application. The views rendered are called PartialViews. 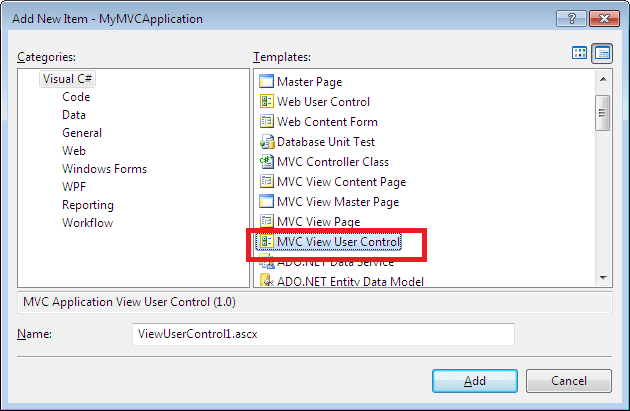 In order to use a partial view in your application add a MVC UserControl to your application. The screenshot below shows which project template to select when adding a user control to your MVC application. You can add the MVC View UserControl in your current view folder or in the shared folder. First the view folder will be searched for the specified user control followed by the shared folder. We have added a simple "Categories.ascx" to our views folder. Now, let’s see how we can load the partial views on the page. 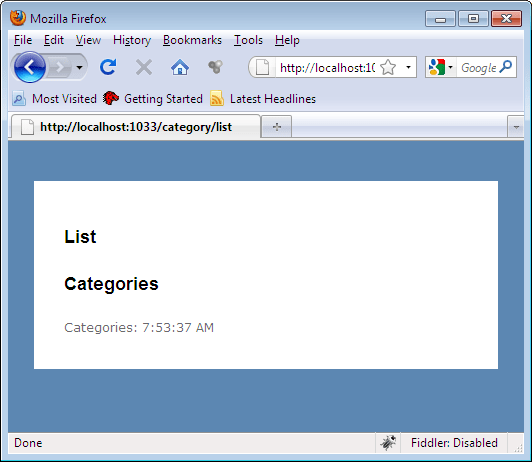 Inside the view page you can load the partial view using RenderPartial HTML helper method. In the previous example our partial view was independent which means it was not dependent on any data populated by the view page. In real world applications this might not be the case. We may need to pass additional data to our partial view. The good news is that the partial view has access to the same ViewData dictionary which is used by the view page. 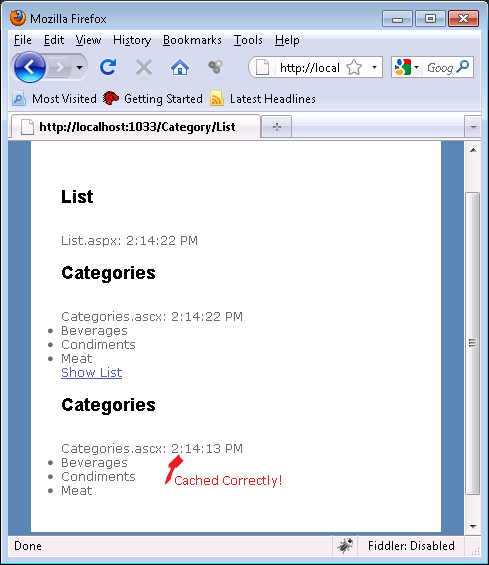 This shows that the ViewData dictionary is shared between the view page and the view user control (partial view). We can even make it better by strong typing the partial view and sending the model as a second parameter to the RenderPartial method. The code below shows how to make the ViewUserControl as a strongly typed view which can handle IEnumerable<Category> collection. And here is the RenderPartial method passing the Model as the second parameter. Or even better you can assign the ViewData.Model and use that to pass the Model to the RenderPartial method. Since, the ViewData dictionary is shared between the ViewUserControl and the ViewPage you can easily make changes to the object in the ViewUserControl and it will be reflected in the ViewPage using the controller. In WebForms you could easily cache the contents of the UserControl. Let’s check out how we can cache partial views in an ASP.NET MVC application. 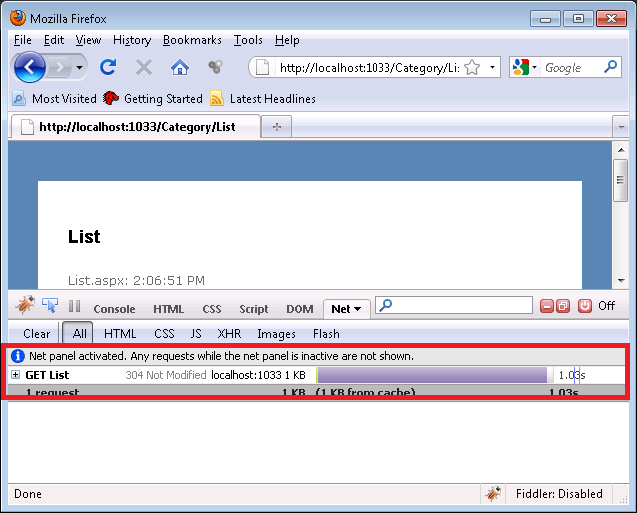 The most direct way of caching the partial views is by using the OutputCache directive. Let’s add the directive on the ViewUserControl and see the result. We are caching the ViewUserControl to "60" seconds which means it is cached to 1 minute. The DateTime is displayed on the view to indicate the request time. The DateTime value will indicate if the partial view is cached or not. The view page List.aspx is also adjusted. It now includes an ActionLink which will call the "List" action. It also consists of a DateTime indicator just like ViewUserControl. When you run the page and click the "Show List" button you will find out that the view user control "Categories" is never cached. Both the view page and the view user control will show the same time. There is a problem inHtml.RenderPartial which prevents it from caching the user control. Html.RenderPartial method completely ignores the OutputCache directive in the user control. Our next technique is to use the OutputCache action filters to cache the contents of the action. This means that we need to return the user control from the controller action. This is performed by using RenderAction HTML helper method. The render action method will invoke the action on the controller and inject the returned HTML to the calling page. The screenshot above shows that the complete view page along with the partial view is cached. Once, again we have failed to cached the component. Let’s see our last approach. Phil Haack blogged about this method a while ago. He leveraged the power of the WebForms engine to cache the partial view. You can read his post here. Now, if you run the application and click the "Show List" button you will notice that the user control is cached at a differen t time than the page. Hopefully, in the future release of MVC the defect in RenderPartial wil be fixed! In this article we learned about Partial Views. We also learned how to perform caching using partial views. In the next article we are going to take a look at the RenderAction HTML helper method and how it can be used in an ASP.NET MVC application. Posted on 19/06/2010 by Trần Phước Hùng	| Bạn nghĩ gì về bài viết này? 23 /// Handles the Click event of the buttonCommand control. Posted on 08/06/2010 by Trần Phước Hùng	| Bạn nghĩ gì về bài viết này? The Spring Framework 2.5 release reflects the state of the art in both the Spring Framework and enterprise Java frameworks as a whole. A guidebook to this critical tool is necessary reading for any conscientious Java developer. The move from so–called heavyweight architectures, such as Enterprise JavaBeans, toward lightweight frameworks, like Spring, has not stopped since Pro Spring was published by Rob Harrop and Jan Machacek in 2005; in fact, it’s picked up pace. The Spring Framework remains the leader in this move and provides a platform on which you can build your own applications and services. Pro Spring 2.5 covers the new features of Spring 2.5, but moreover, it is focused on the best practices and core standards of contemporary Spring development. As members of the Spring development team at Cake Solutions, the author team brings extensive practical experience gained from working with Spring since version 1.0 and delivering successful systems on top of it. Learn the approaches that really matter in a professional, enterprise–level environment, so you can apply them to your projects today, safe in the knowledge that they just work. Discover how to use Spring’s Inversion of Control (IoC). Explore Spring’s excellent aspect–oriented programming (AOP) support, including Spring 2.5’s new @AspectJ feature. Find out how to use Spring’s dynamic scripting language features, Spring design patterns, and performance tuning in Spring applications. Learn what really works in real–world Spring development. Understand Spring’s support for the JDBC framework, Hibernate, the Quartz enterprise scheduler, declarative transaction management, and much more. Master Spring’s well–designed MVC framework and add AJAX to your Spring web applications to create flexible, efficient, and manageable applications using the best techniques available. Jan Machacek is a chief software architect at Cake Solutions Limited (www.cakesolutions.net), a UK-based software company. He has been an early adopter of Spring at Cake Solutions and has seen the dramatic change the Spring framework has brought to the Java world. As part of his job, Jan designs and oversees the development of majority of Cake’s projects. Where appropriate, Jan also applies his interest in declarative programming and artificial intelligence. Throughout his programming career, Jan has designed and implemented large J2EE and .NET systems for the UK government and large private sector bodies. When not programming, Jan enjoys foreign languages; he also enters races and time trials as a member of the Manchester Wheelers’ cycling club. Jessica Ditt is a developer at Cake Solutions Limited. She joined the Cake team in 2005 and has worked on numerous enterprise-level projects, all of which were written using the Spring framework. Jessica has been an early adopter of Spring Webflow at Cake and has become an expert in efficient indexing using Lucene and monitoring deployed systems using JMX. Out of the office, Jessica is a keen volleyball player. Aleksa Vukotic is senior developer of Cake Solutions Limited. He joined Cake Solutions in June 2004. Since joining Cake, Aleksa has worked on numerous Java projects using the Spring framework for variety of clients. His work includes sophisticated systems for the UK government agencies. As part of his role at Cake, Aleksa helps other members of the team with some of the most complex problems, especially related to data access and MVC. He graduated in computer science and engineering at the School of Electrical Engineering, Belgrade University, Serbia. In his spare time, Aleksa enjoys nights out and computer games. Anirvan Cakraborty is a developer at Cake Solutions Limited. Since becoming a member of the Cake team in 2006, Anirvan has worked on the more complex projects, including the UK government knowledge management system. Anirvan is a contributor to Lucene integration in the Spring Modules project. Prior to joining Cake, Anirvan completed his master’s degree in Internet software systems at the School of Computer Science, University of Birmingham, United Kingdom. When not programming, Anirvan enjoys following sports like Cricket and Formula One. He also enjoys reading detective novels and watching movies. For the Broken Links and Like this Book reply Here…. Eclipse – the open source and most popular Java IDE – integrates best-of-breed tools such as JUnit and Ant. As a community version of IBM’s Websphere Studio Application Developer (WDAD), Eclipse offers developers a wonderful opportunity to work in and get acquainted with this technology. It increases productivity and makes code building, testing, debugging, and deploying easier and more streamlined. The plug-in architecture of Eclipse has spawned a large number of Eclipse related sub-projects. With already hundreds of thousands of users worldwide, Eclipse will be the development platform of choice for a large proportion of the Java community. The book is organised in 3 Parts. In the first part, readers are introduced to the Eclipse Java IDE and shown how projects are laid out and the various facilities to help write Java code. To illustrate this a lip synchronization for the Java FreeTTS speech synthesis package is implemented. In Part 2, SWT and JFace (Eclipse’s alternative to the Java AWT and Swing) are described and demonstrated in practice in a JavaLayer based MP3 player. In Part 3 the author shows how Eclipse can be used as a tool platform and an application framework. An Aspell based spell checker that seamlessly integrates into the Eclipse platform and can be used in all text based Eclipse editors is given as an example of how powerful it can be to work within this environment. Designed for Java developers getting up to speed with Eclipse, there is excellent coverage of JFace and SWT; details on how to reuse and extend existing Eclipse components; a guide on how to import third party code and integrate it with your own code, and real-world examples with the code provided on the accompanying website. If you’re reading this, we assume that you’ve just downloaded NHibernate and want to get started using it. Defining a simple business object class. Create an NHibernate mapping to load and save the business object. Configure NHibernate to talk to your local database. Writing simple CRUD code using the Repository pattern. Using Unit Tests to make sure the code is working correctly. Lets start by actually doing something with that ZIP file you just downloaded. If you’ve downloaded the NHibernate binaries in a zip file, all you need to do is extract that file to somewhere sensible. I usually create a folder called SharedLibs c:\Code\SharedLibs\NHibernate and extract the zip to there. But whatever you’re comfortable with. This is your SharedLib folder from which you need to add your references to the NHibernate and NUnit dlls. Add references to NHibernate to both the demo project and the unit test project. That’s it! NHibernate is installed (easy huh). We’ll talk you through using it with Visual Studio in a moment. First let’s look at how we go about creating a project. Note this code is dependent on Visual Studio 2008 and .Net Framework 3.5. Before we start building our application and business objects, we’ll need to create a blank project to put them in. Fire up Visual Studio and create a new Class Library project. Let’s now look at something interesting: creating a business object. Lets start by defining a very simple domain. For the moment it consists of one entity called Product. The product has 3 properties Name, Category and Discontinued. Now we want to be able to persist instances of this entity in a (relational) database. We have chosen NHibernatefor this task. An instance of an entity in the domain corresponds to a row in a table in the database. So we have to define a mapping between the entity and the corresponding table in the database. This mapping can be done either by defining a mapping file (an xml-document) or by decorating the entity with attributes. I’ll start with the mapping file. Create a folder Mappings in the FirstSample project. Add a new xml-document to this folder and call itProduct.hbm.xml. Please note the "hbm" part of the file name. This is a convention used by NHibernate to automatically recognize the file as a mapping file. Define "Embedded Resource" as Build Action for this xml file. In the Windows Explorer locate the nhibernate-mapping.xsd in the src folder of NHibernate and copy it to your SharedLibs folder. We can now use this xml schema definition file when defining our mapping files. VS will then provide intellisense and validation when editing an xml mapping document. In a mapping file when referencing a domain class you always have to provide the fully qualified name of the class (e.g. FirstSample.Domain.Product, FirstSample). To make the xml less verbose you can define the assembly name (in which the domain classes are implemented and the namespace of the domain classes in the two attributes assembly andnamespace of the root node. It’s similar to the using statement in C#. Now we have to first define a primary key for the product entity. Technically we could take the property Name of the product since this property must be defined and has to be unique. But it is common to use a surrogate key instead. For thus we add a property to our entity and call it Id. We use Guid as the type of the Id but it can as well be an int or a long. NHibernate doesn’t get in our way such as that it defines many reasonable defaults. So if you don’t provide a column name for a property explicitly it will name the column according to the property. Or NHibernate can automatically infer the name of the table or the type of the column from the class definition. As a consequence my xml mapping file is not cluttered with redundant information. Please refer to the online documentation for more detailed explanation of the mapping. You can find it here . Your solution explorer should look like this now (Domain.cd contains the class diagram of our simple domain). You will have added the design folder and created the class diagram yourself although this is for good practice and not required for the purposes of this excercise. We now have to tell NHibernate which database product we want to use and provide it the connection details in form of a connection string. NHibernate supports many many database products! With this configuration file we tell NHibernate that we want to use MS SQL Server Compact Edition as our target database and that the name of the database shall be FirstSample.sdf (=connection string). We have also defined that we want to see the SQL NHibernate generates and sends to the database (highly recommended for debugging purposes during development). Double check that you have no typos in the code! Click Add and ignore the DataSet creation wizard (just hit Cancel). The last 8 files you can find in the "Microsoft SQL Server Compact Edition" directory in your Programs folder. Note: the System.Data.SqlServerCe.dll is located in the sub-folder Desktop. Add a reference to the FirstSample project in your test project. Additionally add references to NHibernate.dll, nunit.framework.dll and Systm.Data.SqlServerCe.dll (remember to reference the files located in the SharedLibs folder!). Pay attention to set the property "Copy Local" to true for the assembly System.Data.SqlServerCe.dll since by default it is set to false! Add a copy of hibernate.cfg.xml to the root of this unit test project. Direct action with NHibernate in the NUnit project needs access to this file. We further need the 7 files sqce*.dll in the output directory. We can do this by using a post-build event in VS. Enter the following command in the "Post-build event command line"
The first line of the test method creates a new instance of the NHibernate configuration class. This class is used to configure NHibernate. In the second line we tell NHibernate to configure itself. NHibernate will look out for configuration information since we do not provide any information here in the test method. So NHibernate will search for a file calledhibernate.cfg.xml in the output directory. That’s exactly what we want since we have defined our settings in this file. In the third line of the code we tell NHibernate that it can find mapping information in the assembly which contains also the class Product. At the time being it will only find one such file (Product.hbm.xml) as an embedded resource. The fourth line of code uses the SchemaExport helper class of NHibernate to auto-"magically" generate the schema in the database for us. SchemaExport will create the product table in the database and each time you call it it will delete the table and the table data and recreate it. Note: with this test method we do NOT want to find out whether NHibernate does its job correctly (you can be sure it does) but rater whether we have setup our system correctly. However, you can check the database and see the newly created ‘product’ table. If you have TestDriven.Net installed you can now just right click inside the test method and choose "Run Test(s)" to execute the test. If you have ReSharper installed you can just start the test by clicking the yellow-green circle on the left border and choose Run. Double check also if you have no typos in the NHibernate configuration file (hibernate.cfg.xml) or in the mapping file (Product.hbm.xml). Finally check whether you have set the "Build Action" of the mapping file (Product.hbm.xml) to "Embedded Resource". Only continue if the test succeeds. Now obviously our system is ready to start. We have successfully implemented our Domain, defined the mapping files and configured NHibernate. Finally we have used NHibernate to automatically generate the database schema from our Domain (and our mapping files). In the spirit of DDD (see e.g. Domain Driven Design by Eric Evans) we define a repository for all crud operations (create, read, update and delete). The repository interface is part of the domain where as the implementation is not! The implementation is infrastructure specific. We want to keep our domain persistence ignorant (PI). In the fourth line of the method TestFixtureSetUp we create a session factory. This is an expensive process and should thus be executed only once. That’s the reason why I put it into this method which is only executed once during a test cycle. And now we can implement the test method to add a new product instance to the database. Start by adding a new folder called Repositories to your FirstSolution project. Add a class ProductRepository to this folder. Make theProductRepository inherit from the interface IProductRepository. The first run of the test method will fail since we have not yet implemented the Add method in the repository class. Let’s do it. But wait, we have to define a little helper class first which provides us session objects on demand. This class creates a session factory only the first time a client needs a new session. That’s because NHibernate is by default configured to use lazy load for all entities. That is the recommended approach and I warmly recommend not to change it for a maximum of flexibility. Note the sql spit out by NHibernate. Call this method from the SetupContext method (after the create schema call) and we are done. Now each time after the database schema is created the database is populated with some products. When running for the first time this code will fail since the Update method has not yet been implemented in the repository.Note: This is the expected behavior since in TDD the first time you run a test it should always fail! Analogous to the Add method we implement the Update method of the repository. The only difference is that we call the update method of the NHibernate session object instead of the save method. Run the test again an watch it succeed. The implementation of the GetByName method can be done by using two different approaches. The first is using HQL (Hibernate Query Language) and the second one HCQ (Hibernate Criteria Query). Let’s start with HQL. HQL is a object oriented query language similar (but not equal to) SQL. To be added: implemetation of GetByName using HQL. Implement HCQ as below this works as expected and returns a product entity. In the above sample I have introduced a commonly used technique when using NHibernate. It’s called fluent interfaces . As a result the code is less verbose and easier to understand. You can see that a HQL query is a string which can have embedded (named) parameters. Parameters are prefixed by a ‘:’. NHibernate defines many helper methods (like SetString used in the example) to assign values of various types to those parameters. Finally by using UniqueResult I tell NHibernate that I expect only one record to return. If more than one record is returned by the HQL query then an exception is raised. To get more information about HQL please read the online documentation . The second version uses a criteria query to search the requested product. You need to add a reference to NHibernate.Criterion on your repository page. Many users of NHibernate think that this approach is more object oriented. On the other hand a complex query written with criteria syntax can quickly become difficult to understand. In this article I have shown you how to implement a basic sample domain, define the mapping to a database and how to configure NHibernate to be able to persist domain objects in the database. I have shown you how to typically write and test CRUD methods for your domain objects. I have taken MS SQL Compact Edition as sample database but any other supported database can be used (you only have to change the hibernate.cfg.xml file accordingly). Ee have no dependencies on external frameworks or tools other than the database and NHibernate itself (.NET of course never counts here).